jetPEI™ | Tamar Laboratory Supplies LTD.
NaCl complex-formation solution included (adapted to proper complex-formation,as indicated in the protocol). One ml of jetPEI™ is sufficient to perform 500 transfections in 24-well plates. Bulk quantities are available upon request (10 ml, 50 ml, 100 ml and 1L). Please contact us. 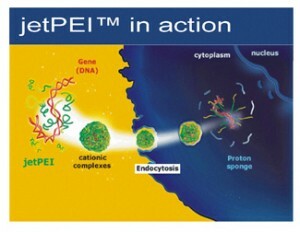 jetPEI™ transfection reagent is a linear polyethylenimine derivative, free of components of animal origin, providing highly effective and reproducible gene delivery.